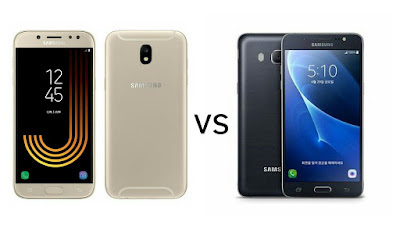 Samsung Galaxy J5 2017 vs Samsung Galaxy J5 2016 : what's different? Samsung has announced Galaxy J5 2017 with Fingerprint Scanner, Android Nougat. Here's what's different in New Galaxy J5 compared to last year Galaxy J5 2016. Both phones come with a 5.2-inch (1280 x 720 pixels) HD Super AMOLED display. Galaxy J5 2017 is powered by a 1.6GHz Octa-Core Exynos 7870 processor whereas Galaxy J5 2017 has a 1.2GHz Quad-Core 64-bit Snapdragon 410 processor.Both Phones comes with a 2GB of RAM and 16GB of internal storage further expandable with MicroSD card. Both has Dual SIM support Galaxy J5 2017 runs on Android Nougat whereas Galaxy J5 2017 runs on Marshmallow. On Camera Galaxy J5 2017 has a 13MP Rear and front camera compared to Galaxy J5 2016 which has a 13MP Rear camera and 5MP front camera. 2017 Galaxy J5 has a Metal body and Fingerprint Scanner which was not available in Galaxy J5 2016.Galaxy J 2017 is packed with a 3000mAh Battery whereas Galaxy J5 2016 has a 3100mAh Battery. Samsung Galaxy J5 (2017) come in Black and Gold colors priced at 270 Euros (US$ 304 / Rs. 19,600 approx.) and will be available in June whereas Galaxy J5 2016 now available in India for Rs 10,999. Galaxy J7 2017 comes with Improved Design, Fingerprint Scanner.